Bring your developers into one workspace with everything they need to get the job done. In this doc, we'll bridge the gap between development teams and organize all of your company's workflows. 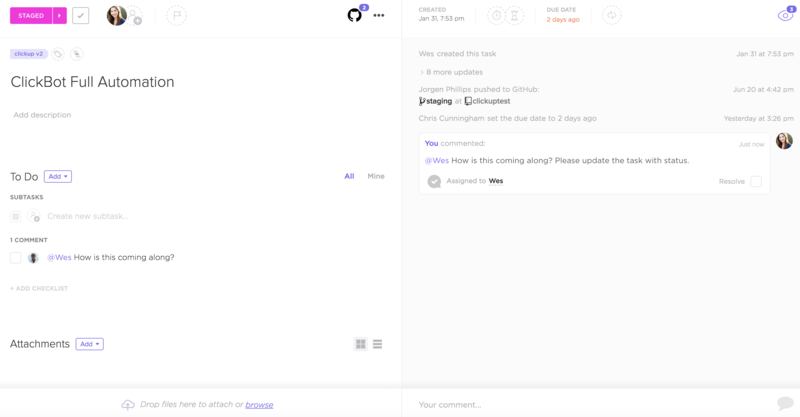 ClickUp even lets non-technical teams connect and work in the same platform. ClickUp's unique organizational structure ensures that each of your tasks will have a clear sense of purpose. Given that software development processes can be prone to unexpected changes, it's critical that your entire team understands how tasks stack up within your overall workflow. Start by creating a Team for your company or organization. This will act as the overarching container for your ClickUp Spaces, Projects, Lists, and tasks. Add a Space called "Development" to house your entire software development process. If you're using ClickUp to run a business, you may consider adding other Spaces within your Team for the different departments within your company. Spaces can be made private as well if you'd like to determine which users have access to view certain Projects. Use Projects to detail the different elements of your software development process. For instance, you could have Projects entitled "Sprints", "QA", and "Operations". Essentially, Projects are "folders" for your more centralized Lists. Lists act as the "tabs" that break down their parent Projects. For example, you can add a List to manage your backlog items within a larger Project. When you're ready to conquer the tasks in the backlog List, just move them into a Goal to start a new Sprint! Tasks represent the concrete action items you'll need to complete to check off your Lists. This is where you can get down to the nitty-gritty details and start implementing your ideas! 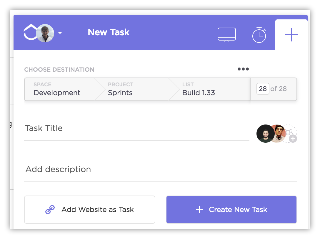 Task creation is totally customizable. You can choose to add multiple assignees, checklists, custom statuses, assigned comments, and more! However, don't worry if you'd rather keep it simple. These features are all optional and can be turned off at any time. This feature is totally unique to ClickUp. Once you're ready to conquer tasks placed in your backlog List, just move them into a Goal to start your Sprint! You'll be able to automatically track your Sprints in real time, and even link tasks from entirely different areas in ClickUp. Custom Statuses for Projects: Certain scenarios require that Projects have different statuses than their parent Spaces. ClickUp makes it easy to create reliable custom status workflows for each Project within your Development Space! Custom Fields: Add a unique task ID to keep track of scrum points, or really anything else you can imagine. Dependencies: This feature allows all of teammates to stay on track and understand which tasks are waiting on or blocking others. Time Tracking: ClickUp offers plenty of time tracking options to help you meet your goals, including external integrations and native time tracking via our Chrome Extension. Time Estimates: This feature enables you to provide better predictability for List and Project completion times. Time Estimates are a ClickApp, meaning you can turn them on or off at the Space level. Reporting: Monitor who's ahead of schedule, who's behind on assignments, and more with six different reports. This feature is only available for Unlimited users. Board View: While ClickUp is the only project management software that allows you to toggle instantly between three different views, Board View is a particularly excellent option for agile development teams. Get an overview of your entire workflow within a Project or List, and easily drag and drop tasks between statuses with just one click. Git Integration: Just include your task ID in a title, and ClickUp will automatically associate the commit with a task! We integrate with Github, Gitlab, and Bitbucket.